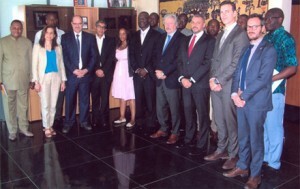 Algiers, 21 June 2016: a delegation of the EUROMED Police Project Director paid a working visit to the African Centre for the Study and Research on Terrorism (ACSRT). The delegation was led by H.E Michel QUILLE, Director of the project. After a warm reception of the illustrious guests, Larry Gbevlo-Lartey Esq., AU Special Representative for Counter-Terrorism Cooperation and Director of the ACSRT, briefed the delegation on the ACSRT mandate and its future plans as the leading centre of excellence in counter-terrorism Research and Capacity Building in Africa. H.E Michel QUILLE explained that the main objectives of the EUROMED project is to strengthen police cooperation between southern Mediterranean countries and EU Member States, and among southern Mediterranean countries themselves, through sharing knowledge, good practices and experiences. The main emphasis of the EUROMED is fighting terrorism and international organized crime. He also underlined the importance of co-operation and information sharing with the ACSRT. The two leaders discussed the challenges faced by European and African countries vis-à-vis the quick evolving terrorism landscape and emphasised the need for in-depth analysis of the related events and trends. Finally, Michel QUILLE and Larry Gbevlo-Lartey Esq., have affirmed their commitment to work closely together on Radicalisation, Counter Violence Extremism and Human Security.